The first phase of a 10-month trial for a zero-emissions, 40-foot, all-electric BYD bus was completed in Gatineau, Quebec and Ottawa, Ontario in December. The evaluation was performed by the Société de transport de l'Outaouais (STO) in conjunction with AVT (the Société de gestion et d'acquisition de véhicules de transport), with partial findings presented at the 2013 EV/VE Conference and Tradeshow in Gatineau-Ottawa by Salah Barj, director, planning and development at STO. 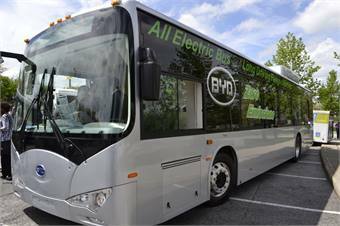 The battery-electric bus was supplied by BYD under a service agreement and continues its evaluations in partnership with the Société de transport de Montreal (STM) until spring of 2014. STO found that the average speed of drivers on Gatineau and Ottawa routes was approximately 15 miles per hour, and the resulting distance the BYD bus could travel at this average speed was approximately 155 miles — the equivalent of 1.3 kWh/ Km without air-conditioning on and 1.5 kWh/ Km with air-conditioning and full passenger loads.